While power banks come in many different styles, colors and sizes, one of the primary differentiator amongst powerbanks is their capacity. Their capacity, which is measured in mAh (milliampere-hour), determines the amount of charge they can hold and consequently the power they can supply your devices. While it’s hard to determine an exact number of charges, the general rule of thumb is that the higher the mAh rating, the more capacity the power bank holds. When looking at a power bank that has a charging capacity of 1000-2000 mAh, you are looking for a small quick fast charge to your smaller type device. This capacity will only give you a small bump in battery power for small devices like a mobile phone or small portable speaker. This size of power bank or charger is great for a lower price point giveaway for a small quick boost in battery! Phone running low on charge while you are out and about? This Portable Custom Power Bank w/ Keyring will help give you at least a 50% charge on your phone! The Suction Cup Custom Power Bank Charger offers a large front for your imprint with your choice of suction cup color. The convenient suction cups adhere to your phone and keeps it in place! Charge your devices easily and conveniently when you are on the go with this aluminum power bank custom charger imprinted with your logo. This aluminum power bank cell phone custom charger will charge your smartphones, MP3 players and more with a Micro USB input. Light up your logo, and keep recipients charged with this UL Certified Light Up Custom Key Chain Power Bank. The split ring keychain easily attaches to keys, zipper pulls, and more! This powerful aluminum power bank cell phone custom charger will charge your smartphones, MP3 players and tablets easily with a Micro USB input. Two awesome tech gifts in one, the Wireless Custom Earbuds w/ Power Bank feature true wireless earbuds and a 2000mAh power bank! The earbuds push into the carrying case to charge. Easily charge your device on the go with this pocked sized promotional power bank. There’s no feeling worse than noticing you’re on 1% battery when you’re heading out the door, needing to respond to an important email or reading an interesting article online. 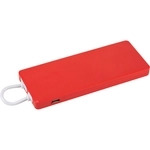 Save your clients and customers the dread of the red battery bar by keeping them connected with a customized power bank with your logo or brand. They’ll start to see your brand in a positive light each time you save them from the annoyance of trying to access information on a dead device. Your customers can use power banks as an external power source to power up a number of phones or portable device with a USB port.They are able to charge the power bank itself via a USB wall charger or by connecting it to the USB port on their computer. Due to the convenience of these items, power banks are one of our favorite products, as well as a one of our best sellers! 1000-2000 mAh power banks can be printed with your logo in a variety of ways. Something as simple as a one color screen print or a laser engraved logo on a metal charger keeps it simple and classy. There are a number of options on the ePromos website to print your full color logo on the power bank for an extra boost of color! Whatever way you want to showcase your brand and logo will be sure to impress with these convenient items. Due to their budget-friendly nature, these items are great for gifts and giveaways. A branded 2000 mAh power bank is an excellent giveaway at tradeshows and conferences, especially for companies in the tech field. If your customer base is younger – such as students or teens – these branded giveaways are especially useful, as millennials are typically very tech-savvy. To really pack a punch, ePromos has custom packing options that can be fully printed with your brand colors and logo. Mobile chargers and power banks also come in a variety of packing options to give your promotional products that extra layer of interest. Most suppliers these days will ship your chargers in a small gift box. Others will ship with them individually polybagged on request. Going the extra mile with custom packaging shows your employees and clients that your brand cares about the little things. So connect with one of our expert Brand Consultants today to find the perfect 1000-2000 mAh power bank for your company today!